2015 Vauxhall Insignia Sports Tourer 1.6 CDTi SRI Nav review | What Car? The Vauxhall Insignia Sports Tourer has always been a practical and competent estate, albeit one let down by rough diesel engines. Now, however, you can buy an Insignia Sports Tourer with the company’s latest 1.6-litre ‘Whisper Diesel’ engine, which promises improved refinement and economy. This new diesel produces 134bhp and 236lb ft, which is sent to the front wheels via a six-speed manual gearbox. In SRI Nav trim, as tested here, the car is claimed to average 65.7mpg and emit 114g/km of CO2, meaning annual VED costs of £30. An Insignia Sports Tourer costs £23,724 in this specification, but it comes with a lot of kit; SRI Nav includes cruise control, sat-nav, a DAB radio, Bluetooth and USB connectivity and single-zone climate control. SRi trim also features lowered and uprated sports suspension, which is aiemd at giving the Insignia the additional dynamic verve it needs to combat finer-driving rivals such as the Ford Mondeo Estate. What’s the 2015 Vauxhall Insignia Sports Tourer 1.6 CDTi SRI Nav like to drive? A comparatively small 1.6-litre diesel might not sound like the best choice for a big estate like an Insignia, because fitting a small engine to a heavier car usually results in the engine being overworked in real-world conditions, leading to unimpressive performance and economy. The Vauxhall’s engine, however, does a sterling job. That’s in part because it produces 236lb ft of torque, which is not far off the output of some bigger diesels. Admittedly it’s not as flexible as a bigger 2.0-litre diesel or similar, meaning you have to be careful about picking the right gear. Drop the revs too low and, while it won’t grumble, you won’t get any acceleration. Provided you keep the revs up above 2000rpm, however, it proves willing. Vauxhall claims a 0-62mph time of 11.2sec, which is more than acceptable for day-to-day driving. It’s a smooth and quiet engine, too, which makes the Vauxhall’s cabin a more pleasant place to be. More impressively, over a 200-mile test route, it averaged 48.0mpg, which is a decent result for a big estate with a small diesel engine. A 70-litre tank means you’ll cover more than 700 miles between fuel stops at that rate of consumption. However, while the engine is decent, the Insignia still lags behind its rivals elsewhere. It doesn't handle particularly keenly, even with sports suspension fitted, and the steering is inconsistently weighted and doesn't feel very precise. More crucially, the ride quality isn't very good. Even on smooth roads the Insignia fidgets around, which makes it tiring to drive over longer distances. There's a fair amount of wind and road noise, too, which further dents its refinement. That said, it's otherwise an easy car to drive. Visibility isn't too bad, although we'd recommend spending £450 on the optional front and rear parking sensors, as they make it much easier to judge in tighter spaces. What’s the 2015 Vauxhall Insignia Sports Tourer 1.6 CDTi SRI Nav like inside? Inside, you’ll find a smart-looking interior. The old cluster of buttons around the centre of the dash is long gone, replaced by a much cleaner and smarter console. It's not badly built, either, and the materials used are of an acceptable quality. There’s plenty of space up front and it’s easy to get comfortable, thanks to a height- and reach-adjustable steering wheel and a range of seat adjustments. However, the seats themselves aren’t particularly comfortable. The bolsters on the seat are quite aggressive, leading to a slightly pinched feel, and you can feel a little perched. You won’t be wanting for room in the back, with lots of head and leg-room for even six-feet-tall passengers. They get a central armrest with cupholders and a storage tray, improving comfort, and three adjustable headrests are fitted. There’s not much of a gap under the front seats for them to slide their feet into though, restricting the amount they can stretch out by. The boot is, as you'd hope, very large, and it features a shallow under-floor storage area, which is good for valuables. There's no spare wheel underneath, mind, just a tyre repair kit. A spacesaver spare is available for £95. It's quite easy to drop the rear seats, which split 60/40 and leave you with an almost flat boot floor, so the Vauxhall's a good shout for those who regularly carry large loads. With the rear seats up, the Insignia offers 540 litres of storage space, which is more than an equivalent Mondeo can muster. With the rear seats down, there are 1530 litres of space, 100 less than a Mondeo. In both cases, the Insignia's boot is smaller than a Skoda Superb's. 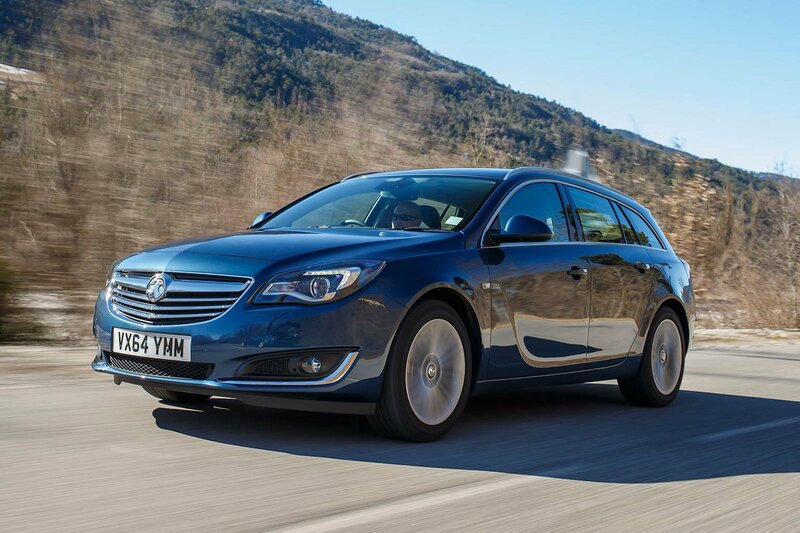 The Insignia Sports Tourer is a smart, practical estate that’s efficient and easy to drive. However, its key rivals – the Ford Mondeo and Skoda Superb – are far more appealing. They are better to drive, similarly good value for money and more comfortable. Both alternatives are also far more modern-feeling than the Vauxhall. For example, you could get a more upmarket-feeling Skoda Superb Estate for a fractionally higher £24,165. It will be faster, thanks its a more flexible yet similarly efficient 2.0-litre diesel, and feature advanced features such as adaptive cruise control as standard. If you could find a Sports Tourer on offer with a hefty discount, however, it would be a more tempting option. We'd recommend avoiding the SRI Nav specification and going for a more affordable model without the sports suspension, though. This would calm the ride down a little and will make the Insignia less of a chore to drive.